Patricia Telles-Irvin speaks at convocation. Though Telles-Irvin spoke about creating a “community of care” within the student body, some think the University could be doing more. A group of Northwestern students created a mental health initiative, #BeWellNU, in response to student dissatisfaction with the University’s mental health services. The four-member group is currently gathering data from a student survey, which they plan to present to administrators during Winter Quarter. While it hasn’t yet settled on a goal, the group said one will be determined after survey results are collected. “It’s really hard as students to create change on an institutional level if you don’t have one unified voice,” said Allison Zanolli, the founder of the initiative. The Communication junior wrote a Facebook post this summer after learning one of her sorority sisters, Angel Wilson, had died by suicide. The post detailed her dissatisfaction with administrators’ responses to student mental health concerns, and said the University was not doing enough to help students maintain their mental well-being. Zanolli was upset by what she called a lack of empathy from the school following Wilson’s death. After multiple students died by suicide last school year, Zanolli said she received very similar, impersonal messages following each one. 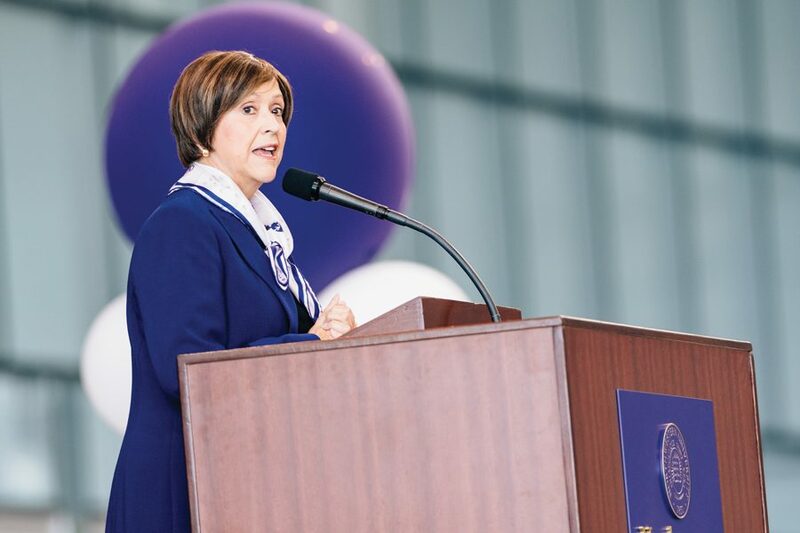 University President Morton Schapiro has since reached out to Zanolli, she said, and Patricia Telles-Irvin, vice president for student affairs, spoke at convocation this year about creating a “community of care” within the student body. However, Zanolli said she thinks the school needs to do more. Zanolli looked at recent results from the survey and said she and other students believe Northwestern needs to be more transparent about student deaths and mental health services at the University. She also called for more funding to Counseling and Psychological Services to meet the need for student support. Telles-Irvin said in an interview last week that she has put in a proposal to increase CAPS staff to the president’s office. She has not yet heard what the final number is, though she does expect an increase. Northwestern was named the fifth most stressful university in the nation by College Degree Research, a college search website aimed toward high school students. Christine Hwang — another member of the #BeWellNU initiative — said this does not come as a surprise to her. The SESP sophomore added that faculty could contribute to a stressful environment for students, because students are still not willing to talk to them about their struggles with mental wellness. “I’ve heard stories with certain professors or faculty not being accommodating enough in terms of people handing in assignments late or not being able to complete something because they’re under so much stress or are overwhelmed,” Hwang said. Telles-Irvin, Zanolli and Hwang agree that in order for the school to remain a safe space for students, there needs to be more awareness about mental health issues in the school.